Gaining first-hand experience working at an overseas human rights organisation can help students develop their legal skills and confidence as well as improve their broader awareness of global issues. At the same time, internships provide students with an opportunity to contribute back to the community. Through its International Human Rights Internship Programme, the Adelaide Law School is committed to helping students to undertake international internships in the field of human rights law. Dr Laura Grenfell has successfully secured federal funding (through the Federal Government’s Overseas Short Term Mobility Programme (STMP) and with the assistance of the Global Learning office) to assist ten Adelaide law students to work with human rights organisations anywhere in the world as part of the Law School’s Human Rights Internship Programme. The first recipient of these STMP grants, worth $2000 each, is Ms Phoebe McCallum who is spending four months over second semester at the United Nations High Commissioner for Refugees in Thailand. 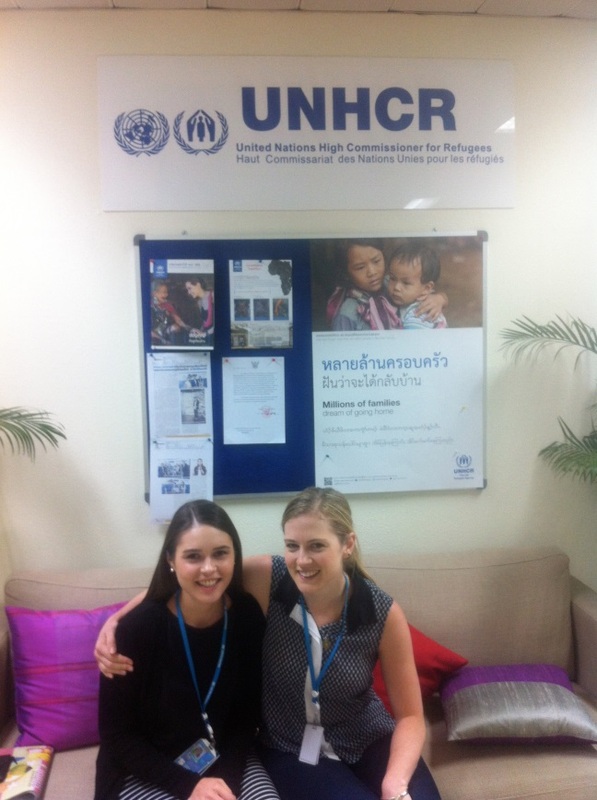 Phoebe is working on resettlement issues and has been able to work alongside an Adelaide graduate, Amy Twinch A second recipient is Ms Megan Lowe who in early September began her four-and-a-half month internship with the Appeals Chamber of the International Criminal Tribunal for Rwanda in the Hague. So far three students have successfully secured international human rights internships over the summer semester; these will take place in Malaysia, South Africa and the Hague. The Law School is expecting that these STMP grants will spur on many more students to undertake international internships. For more information about the International Human Rights Internship Programme, please contact Dr Laura Grenfell and see the Global Learning Program page. This entry was posted in Student and tagged adelaide law school, global learning, Human Rights, Human Rights Internships, un internships. Bookmark the permalink.